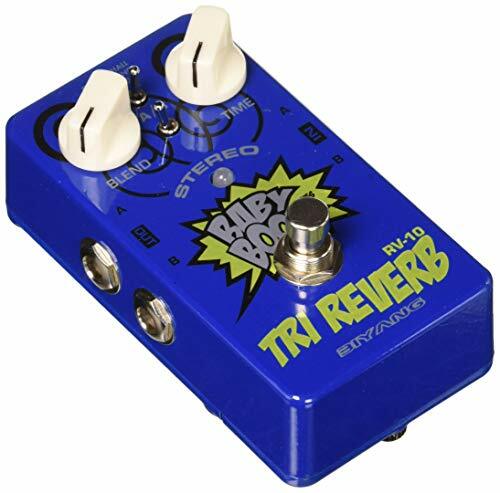 One of the most popular effects in the guitarist’s toolkit is reverb. Surprisingly versatile, it adds a vibrant echo to a rhythm or lead section and lets your solos ring out gloriously at the press of a foot-switch. In this article, we’re going to look at all the different ways you can use this effect and which pedals on the market will best suit your needs. 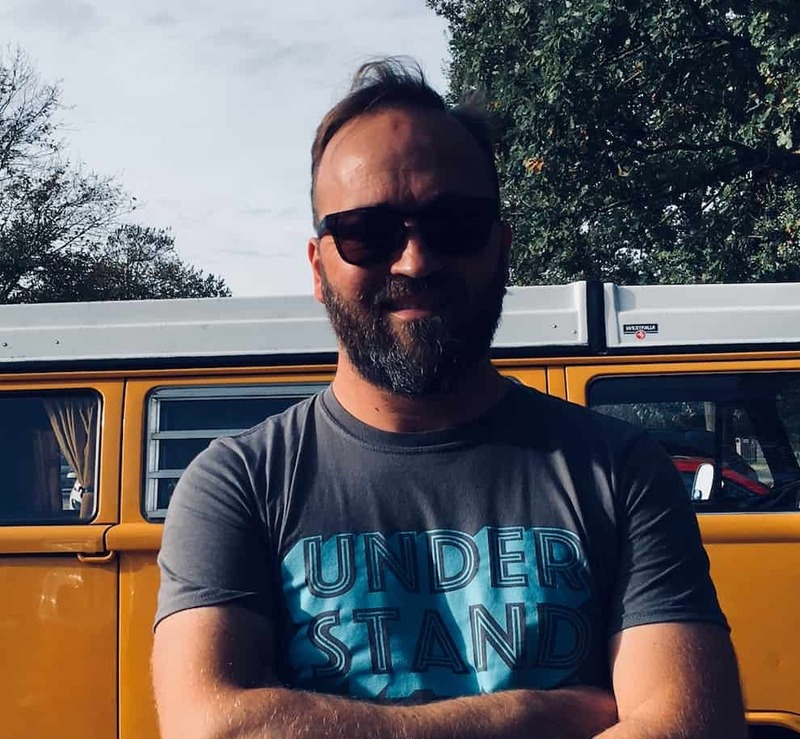 It’s a bit of a minefield trying to choose, so this article will tell you everything you need to know. Ok, let’s get started. Here’s what we’re going to cover. What is the Reverb Effect? Natural reverb occurs when you play an instrument acoustically in a large space. If you’ve ever played guitar in a large hall, you’ll know what I’m talking about. If you want to add reverb to your sound, you have two options: find an amp with an onboard reverb effect, or use a bespoke pedal, which gives you plenty more control over tone. There are a variety of reasons why you’d want to use this effect. For a start, in small amounts, it’s effective at filling out your guitars sound and adding depth. Used more prominently, it’s an excellent way to create spaced out, ambiance tones. It can also be used to produce a full, chorus-like effect which is great if there’s only one guitarist in your band (or if you perform as a solo act). One other benefit is to combat the ‘dry room effect.’ If you ever practice or perform in a small room with soundproofing or very sound absorbent surfaces, it can leave your guitar sounding very harsh and flat. Adding a touch of the effect in your mix can prevent this by recreating depth and reflection in your tone. Now you know a bit more, what are the critical purchasing considerations? Let’s take a look. These pedals usually have various presets (or ‘modes’). Here’s a brief description of them. Spring and plate will make your riffs fuller and can cut through a mix nicely and work well with both electric guitars and vocals. Plate reverbs work in a similar way to springs in that they use a metal plate to produce an echo effect. All the products in this article let you vary the tone but differ wildly in how control they give you. More control doesn’t automatically mean better; the more advanced products in this list provide a bewildering amount of ‘tweakability’ which might be too much if you’re the kind of person who’d rather have a couple of presets to play with and that’s about it. Mono and stereo refer to different sound systems. Mono stands for those that produce monophonic sound via a single-channel, whereas stereo refers to stereophonic which uses two or more channels to create sound. In this case, stereo pedals help you split your sound between two amps to have different echo levels come out of each; this can produce some interesting effects. For lovers of simplicity, we start with TC Electronic HOF Mini. With one big reverb dial that’s set to the hall effect by default, it couldn’t be much simpler. But this little gem has a trick up its sleeve – it comes with TonePrint software functionality which lets you hook it up to a computer (laptop, phone, etc) – once connected, you have a treasure trove of presets to choose from. So want to sound like guitarists such as Steve Vai or Paul Gilbert? No problem. 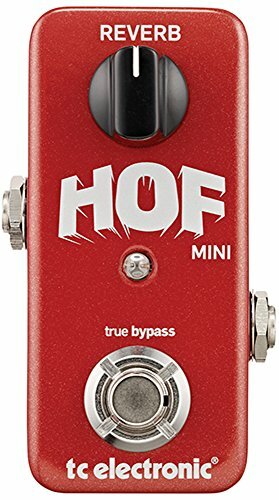 The HOF mini also features true bypass and an Analog-Dry-Through system to ensure great tone without any annoying latency while playing. Overall, it’s suited to guitarists with a mid-range budget looking for versatility. It’s worth mentioning you’ll need some technical knowledge and a computer to work with the software function. TonePrint function gives you access to a gazillion different effects. Uses one dial to control things, so this won’t confuse even beginners. Maybe slightly too simple for some guitarists – once you’ve adjusted it digitally, there is little you can do control wise to add more wet/ dry effects, etc. The software may be hard for the less computer literate guitarist to master and will require some extra learning. At a glance, this looks like something you’d find on a spaceship’s control panel, with so many dials, buttons, switches as well as a digital screen. With so much going on here, it’s hard to know where to start. Altogether it features 86 guitar and bass effects, 6 of which can be used simultaneously and does a lot – it also includes 26 mono and stereo delays, and an onboard tuner, octave effects, EQ, and noise gate modes. Who is this pedal best suited for? Although it’s incredibly diverse, it’s sound quality can be noticeably digital at times, so it’s not suited to those looking for a traditional analog vibe. This pedal suits more experienced players looking to experiment with their sound, or those who need a pedal that can do several jobs at once. So diverse in it’s functioning it’ll suit anyone looking to buy several effects units or a tuner. Allows the player to combine up to 6 effects at once, to create truly unique and specific sounds. Operates with batteries and power supply, so you don’t have to worry if you forget one or the other at a gig. The number of settings offered here may be way too much for some players. The 6-way mix may also add to the confusion rather than help produce a good tone. By trying to do so much at once, it lacks focus and sacrifices some quality compared to other models. Mastering all the effects on offer here may be too time-consuming for some guitarists. The Holy Grail is a neat looking little number that packs a decent quality sound into a small package. This pedal offers three modes: hall, spring, and flerb. The hall setting produces the longest sustaining echo, spring produces a full, warm tone and flerb produces an interesting flange effect. A single dial can easily control the level of all of these modes. 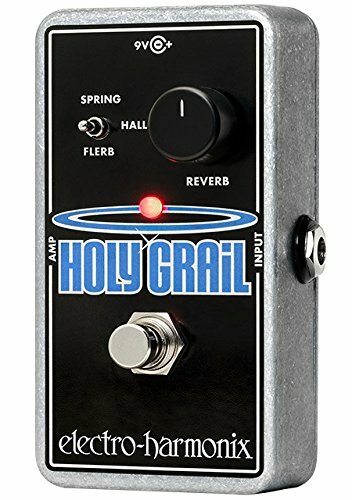 The Holy Grail’s tiny size allows for easy transport to and from gigs, and will easily slide onto your pedalboard without taking up much room. It’s metal casing ensures its valuable electronics are safe from being stopped on, however, make sure to watch you don’t accidentally step on the mode switch or dial when turning it on and off – there’s not much protecting them. This suits more novice players due to its simplicity and ease of use – or more experienced players looking for something simple to use. Very easy to use, three modes and one dial will prevent confusion – almost anyone can use it. It’s tiny, so it will be easy to transport and will fit on your pedalboard without a problem. As digital effects units go, it produces some decent sounds. If you like to mess around with several effects at once, this may not be for you. When turned up to a high level, the hall setting has some latency between your strum and the actual sound produced. No control protection, be careful when you stomp, you might accidentally damage the control dial/ switch. The Boss RV-6 is a rather cool, sleek looking product that’s built like a tank. As well as looking good, it’s great because it offers a good range of quality reverb settings that are easy to control. There are eight reverb modes, ranging from rich delay to sparkling shimmer, along with a dynamic mode option which allows you to add depth to your reverb setting for a full and rich tone. Thankfully, adjustments aren’t too complicated as there are only four control knobs. The E. Level dial controls reverb volume, the tone dial changes the color (i.e. wet or dry), the time dial adjusts the effect’s length, and the mode setting lets you select which effect you want to use. Another bonus of the Boss RV-6 is that you can use it with either a 9V battery or an AC adapter. The only real con here is the price, yes this pedal is on the more expensive side of reverbs in general. But saying that, it does produce great quality reverb effects. Overall, the Boss RV-6 is the best all-round product on this list – it’s not too complicated to get a good variety of tones to suit different music styles. Due to its price and durability, it might be better suited to experienced players looking to gig – this little beast will take a pounding! Simple controls, yet a good variety of settings allow for the player to produce their favorite tone with ease. Robust, stomp proof and gig-proof metal case will last you a lifetime before its insides get damaged. Can use batteries or an AC adapter, for peace of mind if you forget one or the other. One of the more expensive options out there, you might want to look at cheaper designs if you’re shopping on a budget. No good for analog, and is much more suited for modern ambiance than vintage spring and plate modes. 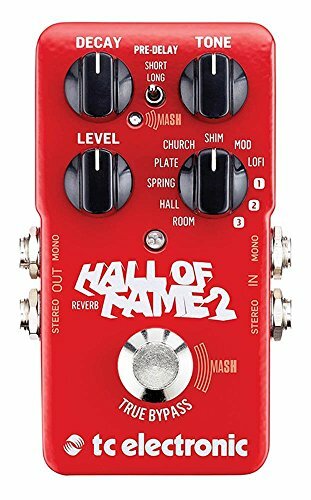 The Hall of Fame 2 is an upgraded version of TC Electronic’s first HOF Mini we previously mentioned. However, this newer model has some interesting new features. The HOF 2 remains fairly simple to use while featuring eight pre-sets and three TonePrint slots (which allow you to add whichever extra effects you like via a computer). This pedal also features the usual controls, but its worth mentioning it also comes with an expression footswitch which allows you to dynamically swell the sound produced, and to even assign other effects to the footswitch for lots of creative potential. The HOF 2 is by far one of the most exciting products on the market. However, it’s software, and numerous settings may be too much for novice guitarists or those that prefer to keep things simple. For this reason, it suits players looking to explore their sound or to have plenty of control. Expression footswitch allows for dynamic swells to enhance sections of songs while performing live, without having to stop and adjust the settings. True bypass means the HOF won’t interfere with your guitar’s signal when it’s not in use. Too much control – For some, the HOF may still be too technical and slightly confusing. Power supply can be noisy, the 9V power supply causes a loud hum while in use. The MXR M300 looks rather simple considering its expensive price tag; however, while it’s aesthetically modest, it makes up for this in a great tone. It features six high-quality reverb styles, with a simple three-knob control system. The plate style produces a rich, shimmering sound, while the spring setting recreates the traditional analog effect. Interestingly, when the spring effect is used with different controls, it can produce a warm vintage sound, and even cutting surf chimes. The Epic mode combines multiple, modulated delay frequencies, for solos that reverberate nicely for longer times. The most exciting setting has to be the Pad setting which uses a unique combination of different octave levels, shimmer, synth modulation, and reverb to produce a modern, spacey effect. Another cool feature is that you can use a Dunlop DVP expression pedal to the expression jack to blend two different settings, which also includes 100% wet mode, stereo input and output capability, as well as a true bypass feature. 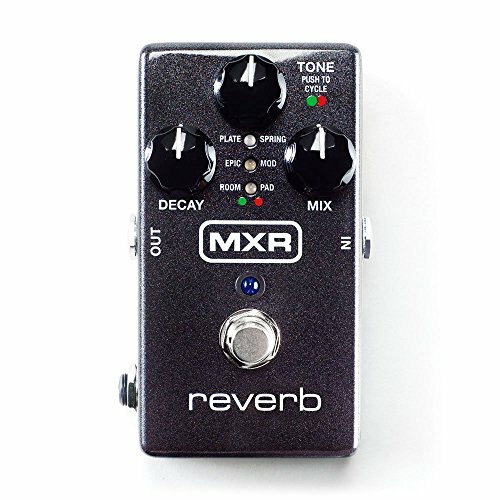 Due to the expensive price tag, the MXR M300 is best suited to experienced players that know what they’re looking for – it’s a great digital reverb tone with simple controls. MXR have not compromised on quality by adding too many effects here. Expression jack allows you to blend two pedal settings for extra diversity. Will not interfere with your signal when it’s not in use, thanks to true bypass. On the more expensive side of things, but you get what you pay for in quality. If you’re looking for a pedal that produces warm, rich analog vibes, this is probably not for you. 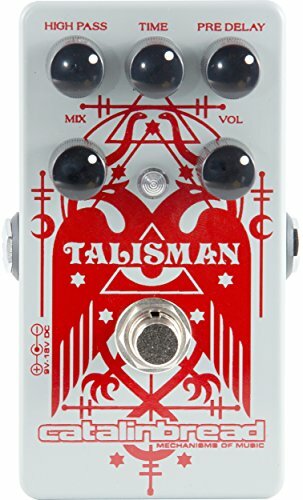 The Catalinbread Talisman is one of the more expensive products out there, however, for its price you do get some pretty nice vibes for your buck. It looks pretty cool, with a red phoenix type image across its body, it’s also minimal, so it will be easy to pack in your gig back and add onto your pedalboard. In terms of tone, it focuses on recreating the analog plate reverb sound used by bands like Pink Floyd and does a fairly good job. There’s also an internal switch, which allows it to be used as a normal reverb box (non-plate) for use with distortion. There are four dials which allow you to vary your reverb sound: High pass, time, pre-delay, mix and volume. The high pass setting adds or reduces high and low frequencies, Time controls the decay, pre-delay allows you to vary the amount of reverb delay, and mix lets you change the ratio of wet and dry signal in your tone. Due to its compact size and great plate tone, its best suited to experienced players with a higher budget looking to play gigs with a more ’70s, analog focused sound. Superb plate reverb recreation – it mimics the legendary analog EMT 140 record reverberator – you’ll have your audience convinced they’re at a Pink Floyd gig. The controls are fairly simple to use and require little extra learning to figure them out. The Talisman is very small and compact, not to mention well protected by a tough metal case, making it ideal for taking on tour. Price – it’s quite expensive. 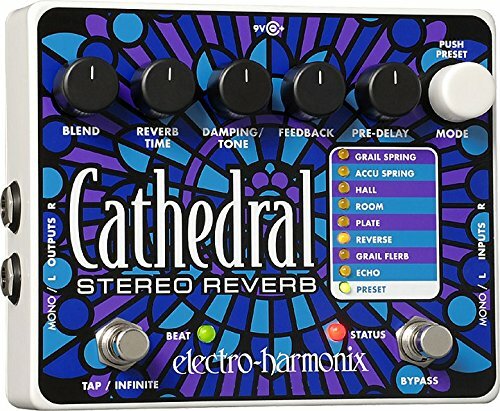 Once again, on the more expensive side, the Cathedral Stereo by Electro-Harmonix is a cool looking gizmo with a stained-glass window effect across its rather large metal shell and comes with stereo output for a huge sound if required. It comes with five control dials and eight reverb styles, which include all the standard modes, along with a reverse and grail flerb setting. 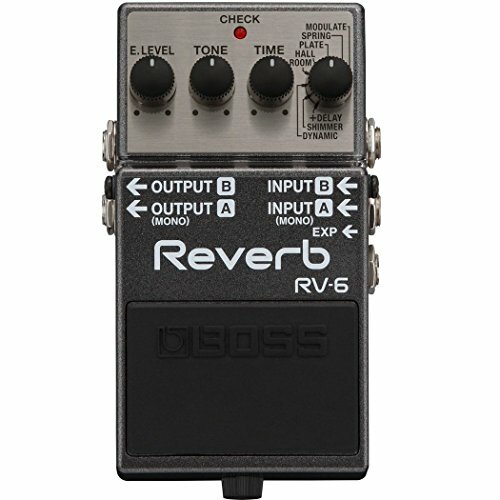 The reverse setting is pretty unique and allows a reverb to fade-in, in reverse. The grail flerb produces a sort of flange effect, which is a cool additional feature. This pedal also features a tap switch which allows you to set the rate of the repeats in echo mode and the amount of pre-delay tempo in the other reverb settings. Additionally, the bypass footswitch allows you to ‘switch off’ the pedal so that it won’t interfere with your sound. It’s worth mentioning the Cathedral Stereo doesn’t fully turn off unless disconnected at the power supply. This suits more experienced guitarists looking for a very durable unit, with a good amount of tone variation available for experimental playing. Its reverse, pre-delay, and echo settings allow you to produce some unique sounds. With five dials, it offers plenty of tone control and a pre-set option. 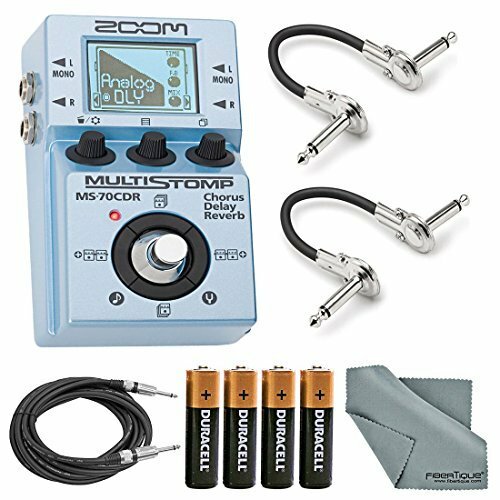 Produces nice digital tone, perfect for modern sounding bands. This is very expensive; you might not need to spend so much if you’re after something a little more simple. If you’re looking for a traditional analog product, this won’t cut it – it’s very modern tonally. Its larger than your average digital unit and might not fit on your pedalboard without some rearrangement. 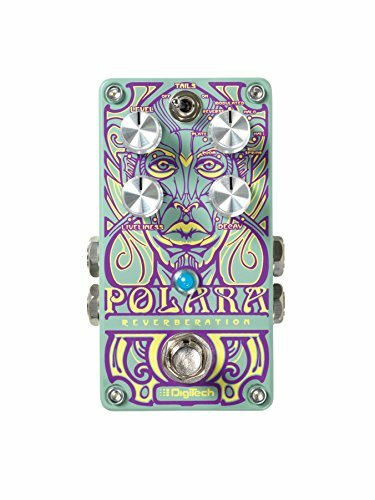 The Digitech Polara Lexicon is very psychedelic looking with a trippy looking purple and green face staring back at you. While you may not love the design, it offers some fun tone controls you might like. For its mid-range price, you get seven reverb programs: room, plate, reverse, modulated, halo, spring and four control dials for volume, treble, release time and reverb program selection. There is also an on/off switch which either lets the reverb ring out when switched on or bypassed when switched off for a clean cut off. A huge advantage of this product is its design: the Polara feels like a tank and has some weight to it, so it won’t budge when being stomped on. It also uses knob guards, which keep the tone dials in place, to prevent accidental movement during use. Due to its price and durability, it’s best suited to players looking for a solid gigging reverb with a more digital tone. It will not damage easily with heavy use. Features a decent selection of controls to create the tone you want without too much extra learning. Fun modes – has reverse (see above) and halo modes, as well as your standard options. The halo mode modulates octave cascades and interspersed decays to produce glowing, angelic soundscapes. Durable – heavy and built like a tank to withstand plenty of use. Sounds very artificial in hall and plate mode, so may not be for you if you’d like something more mellow. Shifting gears to a more affordable offering, the Biyang RV-10 is one of the more inexpensive ones out there but still offers a fairly decent sound considering. Its encased in a funky, deep blue, metal shell and shows off a cartoony ‘Baby Boo’ logo across the middle. The Biyang RV-10 has two dials: blend and time which allow you to change the mix of dry/wet and the length of time that the reverb echoes for. The A/B switch lets the player change from a cleaner tone (A) to a mellow one (B). Of course, it still features standard reverb modes you’d expect. Overall, the RV-10 is very simple and easy to use; however, it may not provide quite enough variety for players looking for controllability. Due to its meager price and simplicity, its best suited to beginner guitarists. Simple controls, unlikely to confuse even beginner players. True bypass will not interfere with your guitar’s signal when it’s turned off. Plastic dials slightly more prone to damage than those with metal alternatives, may not survive gigs too well. When you turn up the time setting while playing on the A switch setting, the reverb can start to distort. Unfortunately, the RV-10 tends to have a relatively short circuit lifespan, so may not be the choice for you if you want something that will last you a lifetime. 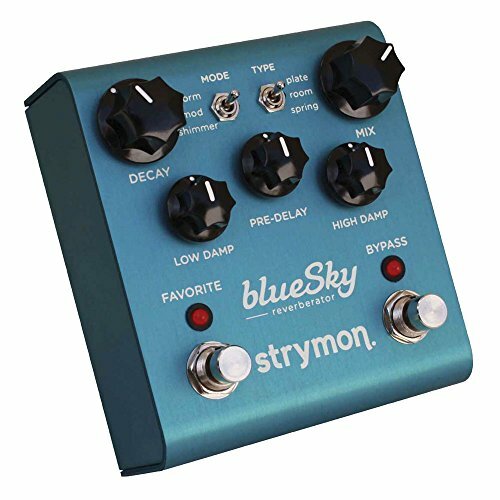 The Strymon Bluesky is one of the most expensive products in this category and, as you’d expect, is fantastic. Aesthetically, it also looks like a pro bit of gear with it’s metallic, light blue finish. 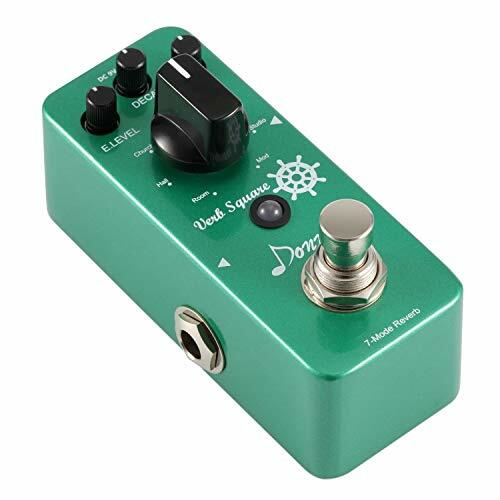 This pedal features 5 tone controls: decay – which controls the decay time, pre-delay – to vary the delay time before the reverberated signal appears, mix – to control the ratio of dry/wet tone in the mix, as well as high/low damp controls which let high end and low-end variation shine through. 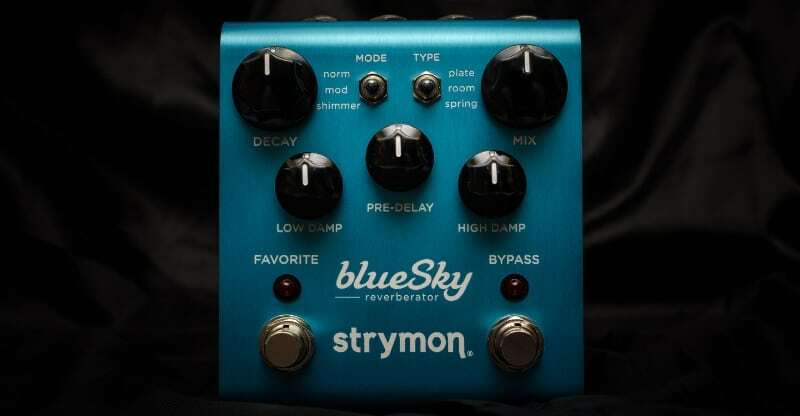 The Strymon Bluesky also has three modes: norm and mod – which both add reverb modulation to varying degrees, and shimmer which produces pitch-shifting octave modulation. As well there are the standard three modes; plate, room, and spring. This pedal also features a handy bypass switch to allow a sharp cut off for impact when finishing your songs. Overall, the Bluesky’s price and variety of tone control make it more appropriate for experimental players that are after high- quality effects. This pedal is also an excellent choice for gigging thanks to its robust metal case. Offers so much variation you could spend hours adjusting the sound and gaining different effects. High-quality, produces some of the best effects out there. The bypass option lets you make a significant impact by suddenly cutting out your reverb tails. One – one of the most expensive, you might want to consider some of the other cheaper alternatives if you’re not completely set on this model. Wider than most, so it might be worth considering if space on your pedalboard is at a premium. The Ghost Echo has a rather spooky aesthetic, thanks to its mostly black exterior and ghostly wavy lines emitting from the footswitch. 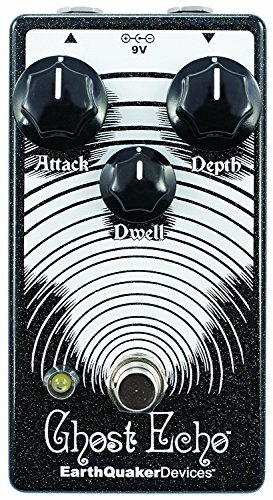 As well as looking cool and creepy, its also pretty simple to use as there are only three tone control dials: attack, dwell, and depth. Attack lets you increase or decrease note clarity, dwell lets you enhance or reduce the decay level, and depth controls the intensity of the reverb. It’s designed primarily to recreate vintage spring units, but some simple tone alteration will allow you to produce hall-type sounds as well. Another bonus is its silent power switch, so you won’t get any noisy click when you switch the device on or off. Because the Ghost Echo is simple to use, yet still rather expensive, it’s best suited to guitarists looking specifically for a great, gig-worthy, vintage spring reverb. There are more versatile products out there if you’re looking for more modern, spacey tones. Realistic vintage spring effect designed to recreate the analog spring effect. Simple controls with just three tone dials, it won’t have you scratching your head for hours, trying to figure out how it works. True bypass won’t interfere with your guitar signal when it’s not in use. Maybe too simple for some players. The lack of controls may not be enough for more experimental styles of music, or those that like their sound to be very specific. Aesthetically Rockett Audio’s Boing is pretty cool if not simple, with its polished metal finish and black ‘Boing’ logo. As well the looks, its probably got the least tone control too – but as we’ve discussed, this isn’t always a bad thing. Sometimes simple is better; in this case, the singular dial works to increase or decrease the level of reverb produced in your sound – that’s about it! 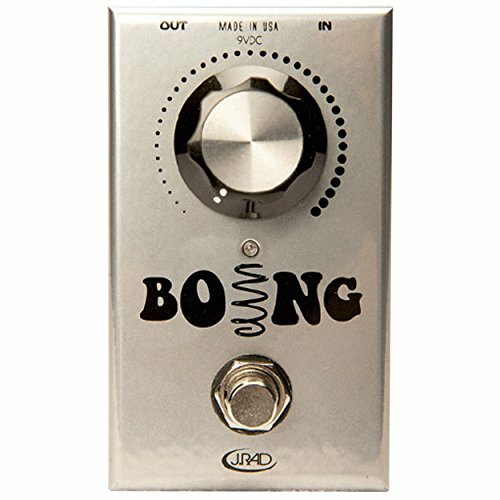 The Boing is unique, however, in that it’s tone cuts through even when used with gain. It does this by keeping a fair amount of your guitar’s dry signal as opposed to pedals that use more wet effect. Another cool feature of this pedal is that you can turn the tone dial with your foot, which is handy when you’re playing a gig. It’s still pretty expensive. However, it’s amazing at providing great tone for those who want to use plenty of distortion in their mix. It’s also well built and protected by its solid metal shell, so will withstand being on tour and plenty of gigs. For these reasons, it’s best suited to guitarists looking to gig with their hard rock or heavy metal band. Extremely simple thanks to its single tone dial. Durable – will take a beating due to its tough metal exterior and sturdy foot use dial. Too simple for some – one of the simplest out there, so won’t be able to create super ambient tones that some of you are looking for. The Donner Digital is one of the cheaper units on the market and is small and simple, enclosed within a green metallic protective case. Despite being relatively cheap, it still offers a variety of reverb tones. These include the standard reverb modes discussed earlier, as well as a church option which allows for longer reverberations compared to the standard hall mode, and a mod option, which produces modulated frequencies, for a flange type effect. As well as having extra mode options, there are also three tone options – ‘E. level’, which controls the overall effect level, ‘decay’ to alter the duration of reverb produced and ‘tone’, to vary the brightness of the sound produced. The seven mode options and three tone variations make this pedal versatile considering its low price. There’s also a true bypass system built in. Overall, for its price, it can produce some really versatile tones. For this reason, its best suited to beginner guitarists looking to get some practice in, or for more experienced players, looking to explore the realms of reverb and find their perfect tone. Price – extremely cheap considering how many tone options you get for the money. Versatile – has plenty of settings that will allow you to play experiment. Portable – it’ll easily fit into your gig bag or onto your pedalboard. Can be noisy – There is a slight hum while in use, this isn’t much of a problem if your practicing at home, but can affect your sound quality badly is used at a gig. Tone quality – very artificial, so is definitely not for those looking for one that replicates analog sound.